This place is literally “to go,” as in even when it’s snowy and rainy outside, you have to carry your warm crepe and seek shelter to enjoy it. I have to give it to them, this kitchen is manned by one person at a time, which is impressive if you’re the only customer in there. 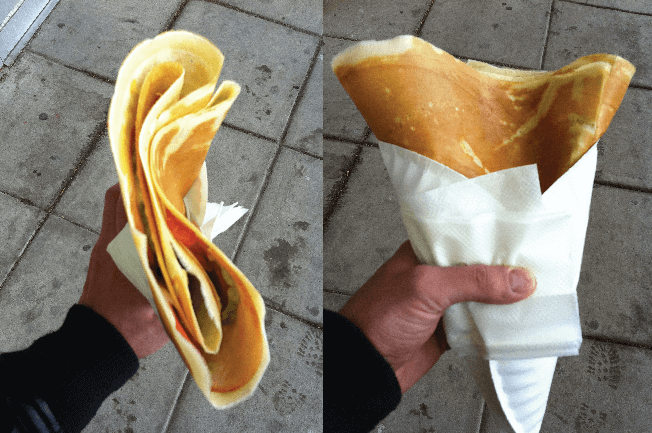 Each crepe takes about 5 minutes from when you order it to when it’s handed to you (in a holster made out of a paper plate and a paper cup—some engineering! It actually works like a charm.) It’s pretty quick… but since there is only one person working there, the lady couldn’t even take the order of the person behind me until she was completely done making my crepe. Luckily, I was first. If there were more than 2 people when I got there I probably would have just left. I ordered a Turkey Corso [$5.80], which consisted of mozzarella cheese, super market packaged roasted turkey breast, tomato, some kind of poor excuse for “avocado,” and honey mustard. The only ingredient that was fresh was the tomato, and the ingredients in general were applied to the crepe in a pretty measly portion, which is why you can barely tell what’s inside in the picture below. Although it was by no means stuffed with the savory ingredients I ordered, the actual crepe itself was soft and slightly sweet, with a crisp to the outside—pretty perfect.